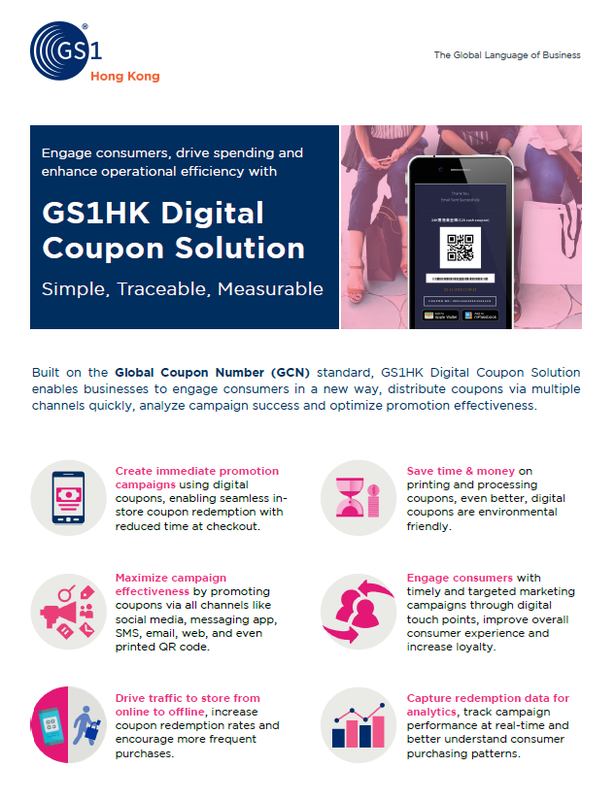 Built on the Global Coupon Number (GCN) standard, GS1HK Digital Coupon Solution enables businesses to engage consumers in a new way, distribute coupons via multiple channels quickly, analyze campaign success and optimize promotion effectiveness. Create immediate promotion campaigns using digital coupons, enabling seamless instore coupon redemption with reduced time at checkout. Save time & money on printing and processing coupons, even better, digital coupons are environmental friendly. Maximize campaign effectiveness by promoting coupons via all channels like social media, messaging app, SMS, email, web, and even printed QR code. Engage consumers with timely and targeted marketing campaigns through digital touch points, improve overall consumer experience and increase loyalty. Drive traffic to store from online to offline, increase coupon redemption rates and encourage more frequent purchases. Capture redemption data for analytics, track campaign performance at real-time and better understand consumer purchasing patterns. Consumers redeem coupons at a store indicated by the redeem locations. Coupons will be validated by an App. Monitor campaign status via online report through GS1 HK Member's Portal or App, gain insight into the amount of coupon scans, downloads and redemption, etc.